I often like to try new recipes when I'm having people over for dinner because it gives me the opportunity to try something that I wouldn't ordinarily make. It's risky, though, because you never know how it will turn out. For soup night last week, I decided to make bread (gluten-free, of course). When I make bread for myself, I usually use the bread machine because I don't really care how the bread looks, and I've found a recipe that I like. But I really wanted to try one of the recipes from Healthy Bread in Five Minutes a Day this time. The book includes a handful of gluten-free recipes, including this gluten-free crusty boule. I won't list the recipe because I followed their recipe exactly (for once! ), so check out the gluten-free boule post on Artisan Bread in Five Minutes a Day for the recipe and wonderful step-by-step pictures. I made half of the recipe the day before, then on the night of the dinner, I divided my dough into two pieces (1 lb each) and baked them on a lightly oiled cookie sheet. I took a chance, and it worked pretty well. Even though we also had bread from Zingerman's, most of my bread was gone. It had a very hard crust (it would pass Chef Novelli's test, if you happened to watch Chef Academy), but was somewhat chewy inside, like most gluten-free bread that I've tried. Although I wouldn't put it into the same category as the whole wheat bread that I used to make, the flavor was very good. I also made cornbread just in case it was a complete failure (and not realizing that someone else would bring bread), but I think I liked the boule better. I can't wait to try the olive oil dough from this book, and I'll let you know how it compares. 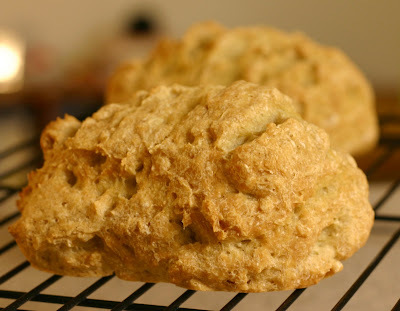 What's your favorite gluten-free bread recipe?? Another lentil recipe?? I know, I know, but this is so different from the soup with lentils that I just shared. This, my friends (and I don't mean that in the John McCain way), is one of the two favorites from Sunday's soup night. It combines several of my favorite foods: red lentils, chickpeas, and quinoa. You really can't go wrong. I adapted this for the crock pot because I was making four soups and only have 2 large pots (it's a good thing that I have 2 crock pots!). It worked perfectly, and there wasn't much left at the end of the night. I'm still working my way through the other leftovers, though. This soup was hearty, and the tender lentils almost melted in my mouth. But the chickpeas were there to provide some complexity in texture. The spices were perfect - nothing overwhelmed the taste, and it had the perfect amount of spice for a crowd with varying tastes. I think this is one of the few examples of a recipe that I won't change the next time I make it. I'm submitting this to January's My Legume Love Affair, which is hosted by EC at Simple Indian Food. Heat oil over medium heat in a medium skillet. Add onion, carrot, and celery and cook until vegetables begin to get tender (about 8 min). Add garlic, ginger, and curry powder, and saute for an additional minute. Add this to a medium crock pot (I used a 3 1/2 quart, and it was almost too small) along with the lentils, tomatoes, water, chili sauce, and chickpeas. Cook on high for an hour, and then cook on low for another 4 hours. An hour before cooking is complete, add in quinoa. At the end of the cooking time, stir in cilantro and season with salt and pepper. Serves 6-8. 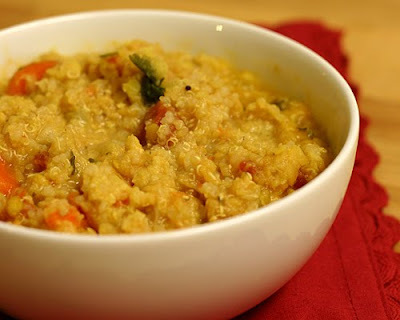 *You can substitute 1/3 cup uncooked quinoa, and add it to the crock pot at the beginning. Add an additional 2/3 cup water. Welcome to soup week. I'll try not to overwhelm you with them, but I have a lot to share. 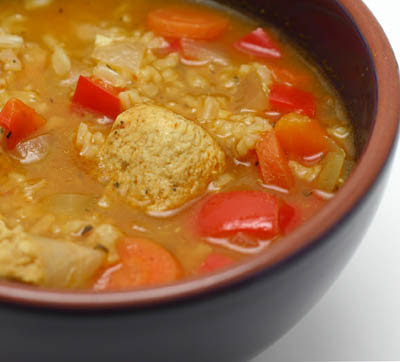 I made several fabulous soups last week, including this one and the chicken and rice stew. Then I decided that I should invite friends over for Sunday Night Dinner, and ended up making 4 more soups. 10 people, 4 pots of soup... you do the math. I'm going to be eating soup for breakfast, lunch, and dinner for the next week (no, I'm not exaggerating). So first I have to share this amazing soup, and then I'll get to the two favorites from soup night. And I'll try to throw some other things in there to keep you on your toes. One of my favorite things about Kalyn's Kitchen is that she includes a lot of hearty, but very healthy, meals. I have a ton of her soups and stews bookmarked, and this got my attention last week. Unfortunately I thought I had far more split peas than I actually had, so I ended up using half green split peas and half brown lentils. 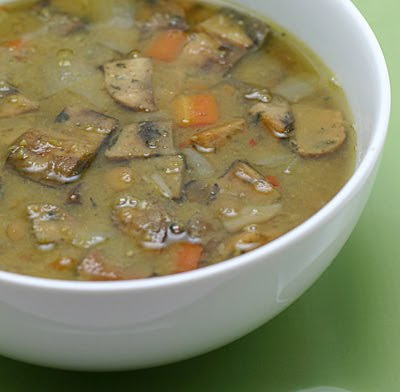 I liked the mix, though - the split peas virtually disintegrate, while the lentils maintain their shape and give the soup a little bit more texture. The second I walked in my door, I was overwhelmed by delicious smells, and it tasted just as wonderful. I love that this soup is very filling, which is exactly what I want on a cold winter day. Brown the diced sausage in a medium skillet over medium heat. Add the sausage to a large crock pot (I used a 5 1/2 quart). Then add the onion to the skillet and saute until tender (you may need to add a little bit of oil if the sausage didn't have much fat). Stir in the red pepper, cook for another minute, and then pour onions into the crock pot. Add carrots, peas, lentils, stock, and water to the crock pot, cover, and cook on low for 8-10 hours. Season with salt and pepper to taste. Serves 6. I've alluded to the fact that I've moving and some of you have inquired about my new destination, and I can finally announce that I'll be heading back to Georgia this summer. I'm incredibly excited for many reasons: 1) I'll be very close to almost all of my family and a lot of my friends, 2) I have a job doing exactly what I want to do, 3) I won't have to put up with winter anymore, and 4) I'll be very close to Atlanta (one of my favorite cities). It's been a grueling few months of applications, interviews, and decisions (though it was nice to be in the position to have to make decisions), and I wanted to do a backflip when I called to accept the job this week. Then I realized that I don't know how to do a backflip and would most certainly end up in the hospital if I tried. So instead, I started cooking. You see, for the past month and a half, I've been gone for about half of every week. Academic interviews are a lot of fun (and I've eaten some of the most amazing food I've ever had), but they're tiring and take up an insane amount of time. I've missed my sanity, but also my kitchen. So, it was time to try something fun. What's more fun than truffles? I had never made truffles before, but a recipe in this month's cookbook of the month caught my eye. 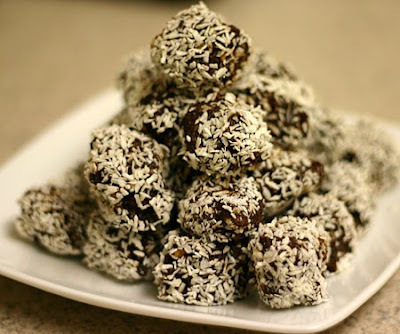 These truffles are very different from what you normally find - they do have a subtle chocolate flavor (from cocoa powder), but mainly consist of dried fruits, including dates, and nuts. I started cooking with dates about the time I started the blog - I bought several books about cooking with natural sweeteners, and of course dates are perfect for that. I have now become hooked. My only problem with dates is that I hate chopping them, but I finally learned that the process is simplified if you cut them up with kitchen shears (just make sure to clean the blades before the date goop becomes too hard). Luckily, you don't even have to worry about chopping them in this recipe. I really enjoyed these - they're sweet, but the coconut provides the perfect contrast so that they're not cloyingly sweet. They're still slightly gooey, but harden up the longer that you refrigerate them. They were the perfect fun treat to celebrate my eventual return to the south :). I'm submitting these truffles to Weekend Herb Blogging, which is organized by Haalo from Cook (almost) Anything At Least Once, and hosted by Anna from Anna's Cool Finds this week. Toast pecans and walnuts over medium heat in a dry skillet, stirring frequently. When they become fragrant (about 5-7 min), set them aside and let cool. Then pour them into your food processor and pulse until they become the consistency of a nut meal (don't overdo it). Pour this into a mixing bowl and set aside. Combine dates, apricots, cranberries, and water in a small saucepan, bring to a boil, and then reduce heat, cover, and simmer for 10 min. Reserve the water off of the fruit and add the softened fruit to the food processor. Pulse until it becomes a paste, adding back some of the cooking water if necessary. Add the fruit paste, zests, lemon juice, cinnamon, cocoa powder, and honey to the mixing bowl and stir well to combine. Spread out 1/2 cup coconut (you may need more later) on a small plate, and take a small piece of the mixture (about 1 Tbsp) at a time, and roll it in coconut. Place each truffle onto a parchment lined baking sheet (they're extremely sticky at this point, so keep them in a single layer). Once you have rolled out all of the truffles, refrigerate for at least an hour, and store them in the refrigerator if you have leftovers (they keep for a few weeks). Makes about 3 dozen. Sometimes I find a favorite recipe because I'm looking for a way to use up a valued ingredient. In this case, I had leftover ricotta from the eggplant, ricotta, and walnut pasta that I made last week, and I didn't even consider making anything but lasagna. 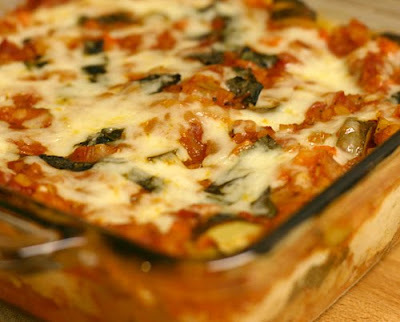 Lasagna is one of my favorite comfort foods, and I love the versatility. I love meat lasagna, veggie lasagna, bechamel-based lasagna, and every permutation possible. Every time I make it, I use a different recipe to try something new, and they're almost all amazing in their own way. The truth is that I tried this recipe out on my family the night before we celebrated Thanksgiving, but I didn't take any pictures and I needed to tweak it a bit. This time it was perfect. A thick sauce full of lentils and vegetables, a very creamy ricotta layer, and delicious brown rice pasta is a combination that can't be beat. Heat oil over medium heat in a medium saucepan. Add onions and garlic, and cook until the onions are tender. 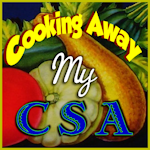 Then stir in celery, carrot, and zucchini, and cook for a few minutes. Add lentils, crushed tomatoes, water, tomato paste, sugar, and oregano, and let simmer for 40 min. Season with salt and pepper. While sauce is cooking, bring a large pot of salted water to a boil and cook noodles for about half the time that the package recommends (I cooked mine for 8 min). Then drain and rinse the noodles. In a medium bowl, combine ricotta, milk, and egg. Place a thin layer of the lentil and veggie sauce on the bottom of a 8x8" baking pan. Then layer 1/3 of the pasta, 1/2 of the ricotta mixture, 1/3 of the basil, and 1/3 of the remaining sauce. Repeat these layers. Layer the remaining pasta, sauce, and basil, and top with the shredded cheese. Bake at 350 for 40 min. Serves 4. The weather has been consistent lately... consistently cold. I probably shouldn't complain because this is the last time that I'll have to endure a Michigan winter, and I know that there are colder places to live. My body still doesn't like it, though, and has been craving lots of soups and stews. This one caught my eye because I already had almost all of the ingredients (I just had to pick up a pepper), which fits nicely with my need to use up everything in my pantry and freezer before I move this summer. I really enjoyed this stew, and it definitely fits into my definition of comfort food. It's very filling, and has kept me warm for the past few days. I particularly enjoyed the combination of herbs and spices (I'm a sucker for anything with cumin). You could certainly make this spicier, but I enjoyed the subtlety of the spice that still allowed the other flavors to shine through. 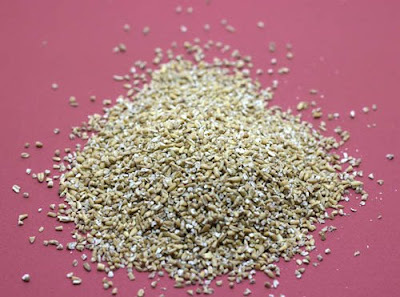 This is also a great recipe to adapt based on what you have in hand - I can imagine all sorts of vegetables or grains being excellent additions or substitutions. Heat oil over medium heat in a large pot. Add onions and cook until they're tender, and then add garlic and cook for an additional minute. Stir in cumin, oregano, paprika, chicken, pepper, and carrots and saute for a few minutes. Then add water, tomato paste, and rice, and let simmer for about 30 min, stirring occasionally. Season with salt and pepper before serving. Serves 5. It's usually not hard for me to avoid buying eggplant when it's not in season because if I can actually find any, it looks like it's been through a war. For some reason the eggplant at the grocery store has been looking decent for the past few weeks, so I ignored the season-conscious part of my brain to try a recipe from this month's cookbook of the month. This was fantastic! 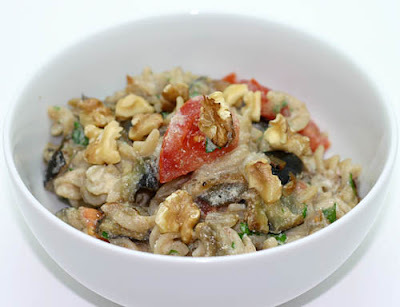 I loved the combination of eggplant, ricotta, tomatoes, and walnuts. The walnuts in particular provided a wonderful contrast in texture. Surprisingly, the eggplant had a lot of flavor, but I'm sure that this dish will be even better with eggplant and tomatoes from your garden or local farm. Sprinkle both sides of the eggplant with salt and let them sit for at least 30 min. Then rinse slices and chop into cubes. Heat the oil over medium-high in a large skillet, and then add the onions and salt and saute until tender. Add the eggplant cubes and cook for 3 min. Then add water, cover skillet, reduce heat to medium, and cook for 10 min, stirring occasionally. While the eggplant is cooking, cook pasta according to package directions. Combine ricotta, parmesan, parsley, cinnamon, and salt and pepper in a large bowl. Drain pasta when it's done cooking, and add it to the ricotta mixture. Stir well, and then add the eggplant mixture and the tomatoes. Sprinkle walnuts on top. Serves 4. 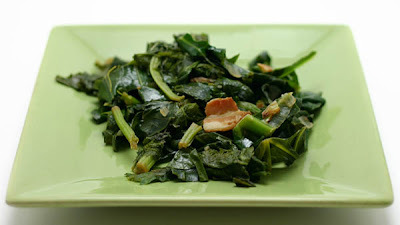 I didn't always like collard greens. I know, I know, I'm a bad southerner. I wasn't ever a picky eater (I even tried to like the loofah that my grandmother cooked as an experiment), but I was incredibly sensitive to bitter foods and beverages. I thought coffee was disgusting (and still don't drink it), literally gagged on beer until a couple of years ago, and never understood how my parents enjoy tonic water. I also didn't like dark chocolate (the horror! ), grapefruit, or greens. Luckily some of that has changed and I now have an intense love for dark chocolate, can enjoy the occasional grapefruit, and like greens in moderation. And just as I was starting to enjoy beer, the gluten issue came about... oh well. Because I was "stuck" in Florida for a few extra days over the holidays, I was able to enjoy black-eyed peas with my parents on New Year's Day. Unfortunately the meal didn't include collard greens (I was too sick to really care at the time), but I decided to make up for that this week. These were really good. Make sure to add plenty of hot sauce - I love the spice and extra vinegary twang, and it also provides just enough salt for my taste. And this is one of the few times when I don't like the idea of using oil instead of bacon. Sure, it will still taste good, but it just won't be the same. Heat a large pot over medium heat, add bacon, and cook just until bacon starts to brown. Then add the onion and cook until it's tender. Pour in vinegar and cook for a few minutes, until vinegar has reduced. Then add the greens, stir to coat with the vinegar, and add the water. Cover the pot and cook until greens are very tender (about 15 min), stirring occasionally. Remove lid and continue to cook until all of the water has evaporated, and then season with hot sauce. Serves 4. After a brief hiatus from stuffing a variety of vegetables, I'm back at it! My love for mushrooms has developed in the last few years. Unlike most of my friends who despise mushrooms, I never had an issue with them, but I didn't seek them out. I remember my mom raving over a portabella burger when I was in high school, and I didn't get the point. Why not go for the beef or one of those fake veggie burger concoctions? Things have changed, and I now appreciate mushrooms to the point that I will go out of my way to put them on pizza, salads, sandwiches, or anything else that is fungus-friendly. But then comes the important question: how do you spell the name of the large ones?? I've seen portabella and portobello, but I'm going to listen to the Mushroom Council and go with portabella (you get extra points if you realized that a Mushroom Council exists). 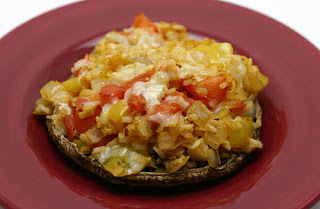 When I discovered a stuffed portabella recipe in this month's cookbook of the month, I knew I would be trying it. This is easily one of my new favorite dishes! I really liked the addition of rice (which wasn't in the original recipe), and I finally learned my lesson about using just the right amount of chipotle peppers. They make a filling side dish, but would also work for a meal. They're hard to eat neatly, but I'm convinced that messy foods taste better. It's good to be back to my stuffed vegetables (even though mushrooms aren't really vegetables... shhh!). Heat oil over medium heat in a medium skillet. Add onion and garlic and saute for a few minutes, until onion begins to get tender. Then add bell pepper, chipotle pepper, cumin, cardamom, and paprika, and continue to cook until bell pepper is tender. Taste and season with salt and pepper, and then stir in rice, tomatoes, half of cheese, and cilantro. Place the mushroom caps in a large baking dish upside down, and mound the filling on top of each cap. Sprinkle the remaining cheese on top, cover the dish with foil, and bake at 350 for 30 min. Then remove the foil and bake for another 10 min. Serves 4. I haven't baked in months, but for some reason the excitement of being back in my kitchen motivated me to do some baking. It probably had something to do with the fact that I received the brand new Moosewood cookbook, Moosewood Restaurant Cooking for Health, for Christmas. It has lots of great recipes, including baked goods that feature whole grains and very little sugar (and some are already gluten-free!). I'm really excited about a lot of the recipes in the book, so it's going to be January's cookbook of the month. 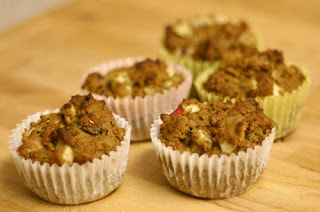 These muffins have large chunks of apples interspersed in the bran base. I really liked the large pieces of apple, and the muffins were delicious. I had to modify this recipe to eliminate the gluten, but it turned out very well. They were dense, but reminded me of the whole wheat muffins that I made back in the day. Honestly, I think I prefer a dense muffin. 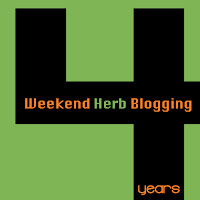 I'm submitting this to Weekend Herb Blogging, which is organized by Haalo from Cook (almost) Anything At Least Once, who is also hosting this week. Combine the eggs, yogurt, vanilla, and honey in a large bowl. Stir in the apple, dates, and rice bran. In a separate small bowl, combine the baking mix, baking soda, salt, cinnamon, oats, and flax meal. Stir this into the large bowl and combine well. If the batter is extremely thick, add water as needed (it should still be thick, not runny). Place muffin liners in a muffin tin, or lightly oil tin, and evenly divide batter between the cups (the cups will be about 2/3 full). Sprinkle walnuts on top, if desired. Bake at 375 for about 20 min, until a knife inserted in the center of one of the middle muffins comes out clean. Let cool before storing. Makes 12 muffins. I've discovered a serious problem when I cook at my parents' house. Apparently I've slowly reduced my salt intake to the point that my parents have to dump salt onto everything that I make. And it's not that they use a lot, it's just that I don't use much at all... but don't notice. It was an issue at Thanksgiving, so I decided that I would make a conscious effort to use more salt at Christmas. Unfortunately I went overboard. 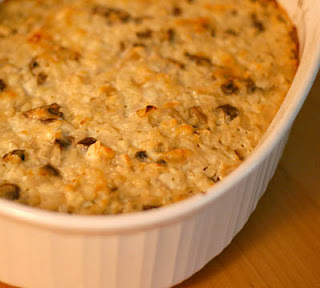 I made this mushroom and brown rice casserole for Christmas dinner, and I could barely eat it. I felt like I was licking pure salt crystals. However, somehow underneath it all I could taste a wonderful casserole... and I desperately wished that I hadn't covered it up. Others seemed to enjoy it quite a bit, too, although a few days later Dad even admitted that it was on the salty side. I had no idea that my tongue had become that sensitive to salt, and I'm not sure what I'll do next time I'm visiting, but I surely won't use too much the next time I make this casserole. It doesn't deserve it. Bring a medium saucepan of water to a boil, add rice, and let simmer uncovered until rice is tender, about 30 min. Then drain and set aside (or use another rice cooking method). While rice is cooking, heat oil over medium-high heat in a medium sauce pan. Add mushrooms and salt and cook until mushrooms are tender and most of their liquid has evaporated (about 10 min). Then add onion and cook until it's tender (a few more minutes), and stir in garlic and cook for an additional minute. Remove this mixture from heat and set aside. Beat the eggs in a large bowl, and stir in cottage cheese and yogurt. Then add the mushroom mixture and the rice to the bowl and stir well. Season with extra salt if needed, but be careful!! Pour this into a lightly oiled 11x7" baking pan (or something of a similar size) and top with parmesan. Cover with foil and bake at 350 for 30 min, then remove the foil and cook for an additional 20 min. Serves 8. I was looking forward to a quiet New Year's Eve for a change, and boy did I get what I asked for. I thought that I would be in a hotel somewhere between Florida and Michigan, but instead I was still in Florida and discovering that I had developed a sinus infection (these things are painful!). Hopefully the antibiotics will work their magic and I can begin the trek north tomorrow, but the plus side is that now I'll get to enjoy black-eyed peas and cornbread with my family (though I don't think we're having collard greens, which is a travesty). The end of December also brings us to a wrap-up of this month's cookbook of the month, Rick Bayless's Mexican Everyday. 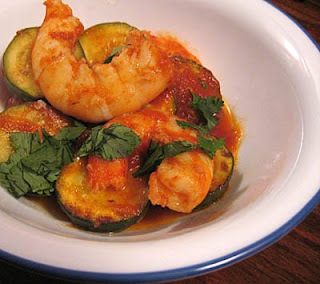 I made two recipes from the book for my parents, a mushroom-potato soup with roasted poblanos and this chipotle shrimp and zucchini. The soup was good, and was very different from other potato or mushroom soups that I've ever eaten, but it was probably my least favorite of the dishes that I tried from the book because the others were outstanding. Well, outstanding if people can eat it. The chipotle shrimp and zucchini was a bit to hot, and all of our noses were running after the first bite. Actually, I wish we hadn't eaten it all last week because it might help clean out all of the gunk that is currently living in my sinuses. I really liked the flavor, though, and I can tell that it would be excellent with a bit less pepper. This recipe, the spinach and mushroom enchiladas, and the Oaxacan yellow mole were fantastic, and have placed this book into my list of favorites. I love the alternative ideas that Rick gives with each recipe, and he makes me confident that I can produce something similar to an authentic Mexican dish. I definitely want to try out some of his other books. Drain the tomatoes, pour them into a blender with the chipotle pepper, and blend until smooth. Heat the oil in a large skillet over medium heat. Add the zucchini, and cook until it begins to get tender (about 5 min). Then add the garlic and cook for an additional minute. Pour in the tomato and pepper mixture, and cook for 5 min, stirring frequently. Then add the water and salt. Stir in shrimp and cook until they turn pink (about 4 min), and then garnish with cilantro. Serves 4.